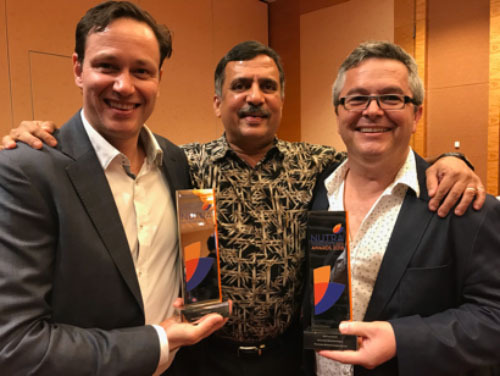 Pharmako Biotechnologies (Australia) was awarded the coveted Start-Up of the Year award and the Botanical Product of the Year award from NutraIngredients Asia. The Start-up of the year award was awarded to Pharmako in recognition of the company’s commercial success, sound science, research and technological advancements. Its branded curcumin ingredient HydroCurc™, also received the Botanical of the Year award for its innovative dispersion technology which delivers up to 90% curcuminoids with only 10% excipients. There were up to four finalists in each category and winners were selected based on submissions demonstrating the company’s scientific merit, market potential, innovation and ability to increase market credibility. Winners were announced at the NutraIngredients reception during Vitafoods Asia 2018 in Singapore. Founders of Pharmako Biotechnologies, Eric Meppem and George Kokkinis , graciously accepted the award along with R.V. Venkatesh, managing director of Gencor (Calif.) who is Pharmako’s North American partner and distributor. Pharmako specializes in scientific research and innovative product development. Its other technologies include AquaCelle™, a Self-Micro-Emulsifying Drug Delivery System (SMEDDS) and Compressible Powdered Oils (CPO), a material which allows oily liquid active ingredients to be converted into powders. The award winning ingredient, HydroCurc was also a finalist in two categories for the NutraIngredients USA awards earlier this year.